This heavy-duty print solution delivers colour output at 70 ppm, with versatility and quality, which fit perfectly in your workflows, whilst safeguarding information and protecting the environment. 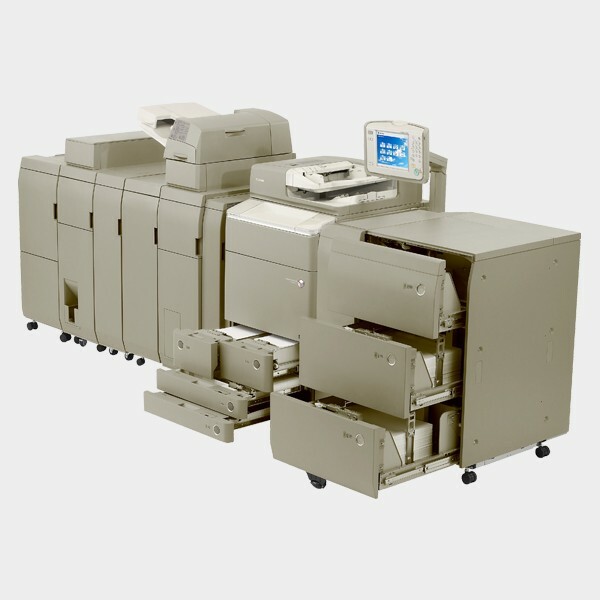 The iR-ADV C7280i prints at 80 ppm in BW and 70 ppm in colour and handles flexible media up to 300 gsm and SRA3 size, from a maximum 9,300-sheet paper capacity. Powerful scanning captures paper documents and converts them to flexible formats, including Office Open XML PPT and Word, ready for digital re-use. For an added dimension of high-speed processing, job management and workflow automation, couple your device with the optional Fiery-based ColorPASS-GX400 or imagePASS-A2 controller. A customisable large 21.3 cm touch screen provides an unrivalled user experience. You can simplify common tasks through one-touch buttons to save time and effort. Mobile workers can easily print from or scan to their mobile devices. The iR-ADV C7280i prints at 1200x1200 dpi resolution with sharp text and clear images, while the pQ toner delivers balanced colours and consistent image quality. Professional in-line finishing and Canon’s iW Desktop software enable you to create trimmed booklets, stapled, punched and folded professional looking documents with ease. With Fiery variable data printing you can produce targeted communications, such as direct mail, and there are many more useful features to enhance your business communications. Integration into networks and enterprise solutions, resource sharing and the ability to link to Cloud services enable you to work and share documents flexibly. The embedded MEAP platform integrates tightly with a range of powerful software supporting and optimising business critical workflows. Device management tools allow you to configure, manage and upgrade your device, individually, or as part of a larger fleet, and to monitor, report and diagnose for proactive and efficient maintenance. Smart user authentication puts you in control of user access and rights, whilst providing visibility and activity tracking through reporting. Your information is protected to the highest level through a range of standard and optional features for device, network and document security. This ENERGY STAR® qualified device offers one of the lowest TEC ratings in the industry thanks to Canon’s on-demand fixing. The device is also built using bio and recycled plastics where possible. UFRII: Windows XP/Server 2003/Vista/Server 2008/Windows 7/Server 2008 R2/Windows 8, MAC OS X (10.4.9 or later) PCL: Windows XP/Server 2003/Vista/Server 2008/Windows 7/Server 2008 R2/Windows 8 PS: Windows XP/Server 2003/Vista/Server 2008/Windows 7/Server 2008 R2/Windows 8, MAC OS X (10.4.9 or later) PPD: MAC OS 9.1 or later, MAC OS X (10.2.8 or later), Windows Server 2003/Server 2008/XP/Vista/Windows 7/Windows 8 Please refer to http://software.canon-europe.com/ for availability of print solutions for other operating systems and environments including AS/400, UNIX, Linux and Citrix. Some of these solutions are chargeable. SAP Device Types are available via the SAP Market Place.